Dr. Luis Camara Dery, a noted historian and professor at the History Department of the De La Salle University, formally handed over to the Libraries his personal papers, published books and manuscripts on 21 September 2015 at the EDC Multipurpose Room, The Learning Commons, 13F HSSH. This unique collection was donated to the Libraries to ensure its survival for future generation of historians. Dr. Dery specializes on Philippine political and socio-cultural history from pre-colonial period to World War II. Most of his works have been published in various national and international publications. As a respected historian, he became the President of the Philippine Historical Association in 2013 and 2014. His collection includes rare Filipiniana publications about Jose P. Rizal during the Spanish period and the early Philippine Republic; local history of provinces; and a range of newspaper issues, school publications and other underground papers that were circulated during the Martial Law years. Some of his published works are Pestilence in the Philippines: A Social History of the Filipino People 1571-1800 (2006); Awit Kay Inang Bayan: Ang Larawan ng Pilipinas Ayon sa mga Tula't Kundiman na Kinatha Noong Panahon ng Himagsikan (2003); The Kris in Philippine History: A Study of the Impact of Moro Anti-Colonial Resistance, 1571-1896 (1997); Army of the First Philippine Republic and Other Historical Essays (1995); From Ibalon to Sorsogon: A Historical Survey of Sorsogon Province to 1905 (1991); and When the World Loved the Filipinos and Other Historical Essays (2006). The turnover was attended by Br. Raymundo Suplido FSC, DLSU President, Ms. Kai Shan Fernandez, Associate Vice-Chancellor for Academic Services, Prof. Michael Chua, faculty members of the History Department, students and librarians. In his message to the University, Dr. Dery expressed his sincere gratitude to Br. Andrew Gonzalez FSC, former DLSU president who was instrumental in becoming a productive and research-oriented professor at the History Department. The Libraries is pleased to invite the community to the third session of the Human Library on 29 September 2015(Tuesday), 2:00pm to 4:00pm at the European Documentation Centre, The Learning Commons, 13th floor, Henry Sy Sr. Hall. The human library concept originally started in Copenhagen, Denmark. The Human Library is composed of human books that a "reader"/user can interact with. The human books selected are people who are subjected to stereotyping and prejudices. They have volunteered to be public representatives of their respective groups so as to share to others their personal stories beyond the stereotypes and prejudices. 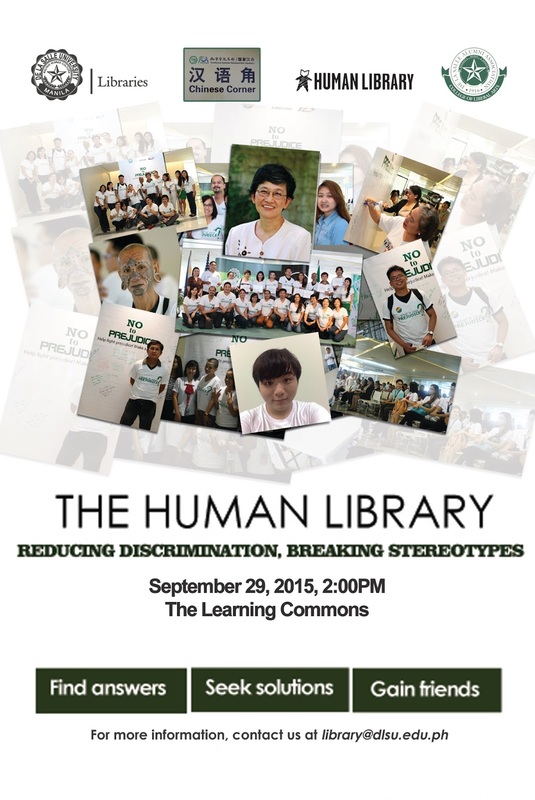 As part of the Libraries' aim to cultivate an image of sensible and sensitive community of Lasallians towards social issues, this activity is an alternative way of learning, which may promote dialogue, reduce prejudice and encourage understanding of people from different walks of life. The first ever human library event in the country was successfully held at the DLSU last 14 August 2014, followed by the second session last 18 November 2014. The third session focuses on the Filipino-Chinese theme, which carries a set of human books on the young entrepreneur, student athlete, woman business leader, crime prevention advocate, among others. This activity is in partnership with the Chinese Corner and the De La Salle Alumni Association - CLA Chapter. Interested participants may pre-register through this online registration not later than 25 September 2015 (Friday). The Libraries is inviting all students, faculty and researchers in the engineering, computing and allied fields in science to participate in the free 60-minute training session on IEEE Xplore® Digital Library, a powerful resource for discovery and access to scientific and technical content published by the IEEE (Institute of Electrical and Electronics Engineers) and its publishing partners, on Tuesday, 29 September 2015 at the Phinma E-Classroom, Room 303, Miguel Building. Interested students and faculty members are requested to kindly fill out this Online Registration Form to register. 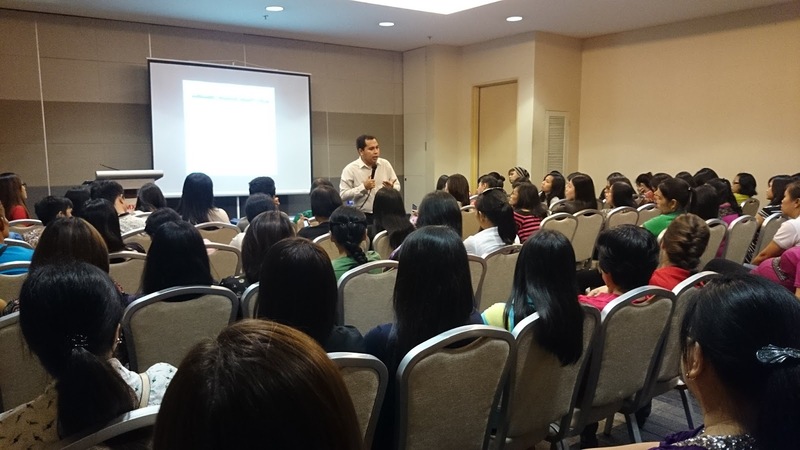 Forty (40) slots are available for this training. Registration ends at 5:00PM on Monday, 28 September 2015. The Libraries proudly presents, Dekada '70 as Video Pick of the Week. This video is based on the novel, story and screenplay by Lualhati Bautista, directed by Chito S. Roño. It will run from September 14 to 1​9, 2015 at the TV corner, The Learning Commons, 6th floor, Henry Sy Sr. Hall. The Bartolome, a simple middle-class family gravely suffered during 1970’s the year when the newly elected President declared Martial Law. This family does not open deal with the oppressive government but is also struggling to keep their family intact despite their distinct differences (from source video). Video Pick of the Week is an initiative to promote media literacy in the academic community. 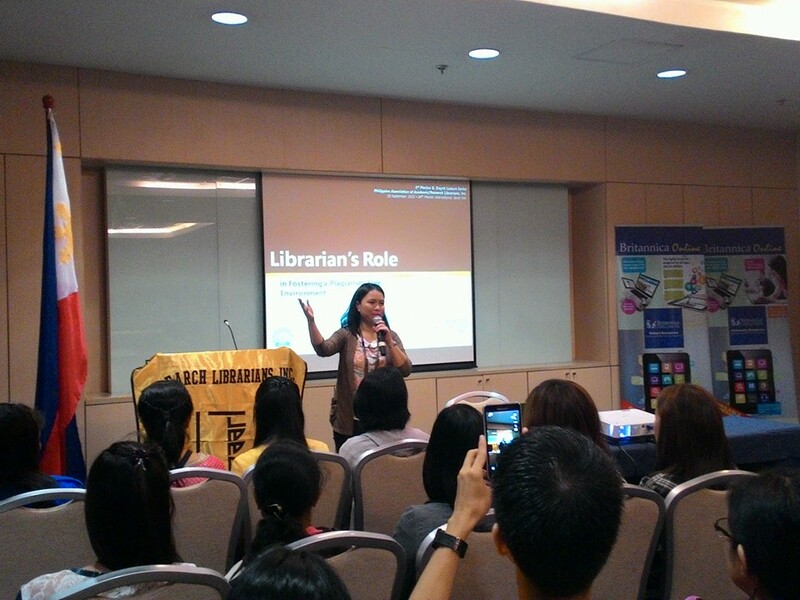 It also aims to promote the audiovisual collection of the Instructional Media Services (IMS) of the Libraries. 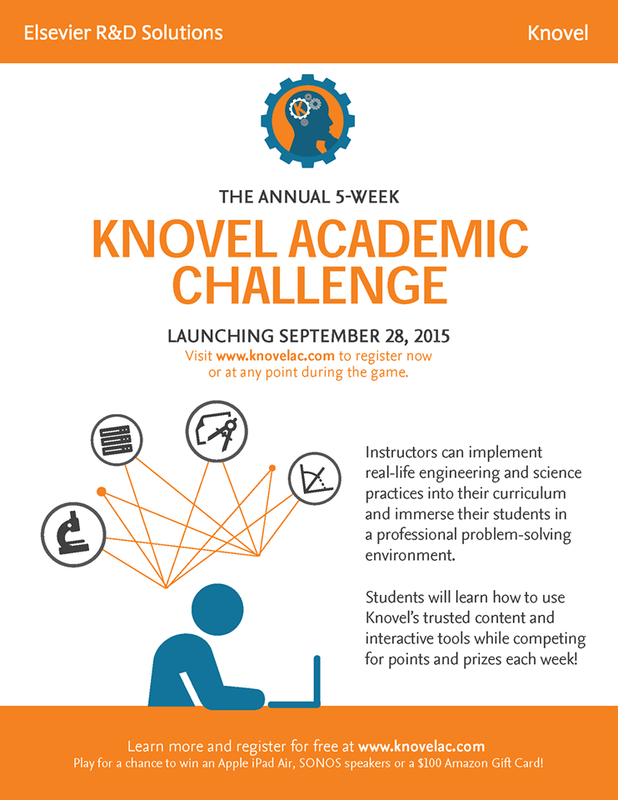 Pre-Registration to Knovel Academic Challenge is Now Open! 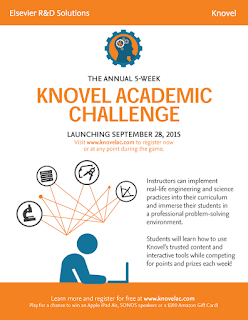 Pre-registration to the Knovel Academic Challenge is now open to the STEM community! The KAC is a 5-week problem set-based global game for undergraduate and graduate engineering students. These problem sets are built from real-life engineering exercises and scenarios. Every Monday of each week, a problem set containing 7-10 multiple choice questions will be posted. Over the span of The Challenge, students will log in with their KAC credentials to solve that week's problem set and earn points based on their performance, while competing for weekly and grand prizes. Weekly winners will be announced each week and the grand prize winners will be announced at the end of week 5. The first problem set will go live on Monday, 28 September 2015 at 12:00:00 AM PST and the last set going out on Sunday, 01 November 2015 at 11:59:59 PM PST. In order to join the competition, one must first register at the KAC site. Registration remains open throughout the 5-week challenge. Knovel is an engineering decision-support solution that enables engineers to solve problems faster. Widely used across higher education STEM communities, the tool provides general reference and best practice insights, process and design applications, material and substance properties data, and equations for specific engineering disciplines. 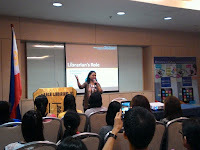 On 01 September 2015, the American Corner Manila hosted a film screening of Lives Worth Living to highlight the awareness campaign for people with disabilities around the world. Lives Worth Living is a documentary film about the Disability Rights Movement that portrays the challenges, problems and barriers faced by people with disabilities to secure civil, political and social rights (learn more about the film here). Appointed Special Advisor for International Disability Rights at the U.S. Department of State, Judith Heumann, graced the event in her first leg of a series of engagements with the Philippine government, civil society groups and student on the rights of people with disabilities (read more about SADR Judith Heumann here). Other U.S Embassy officials present in the event were Ms. Carolyn Glassman, Public Affairs Counselor; Ms. Rachael Parrish, Embassy Human Rights Officer; and Ms. Princess Grace Wooden, Deputy Director of Thomas Jefferson Information Center. The event was attended by students from De La Salle-College of Saint Benilde School of Deaf Education and Applied Studies. The Libraries proudly presents, The Social Network as ​Video Pick of the Week. This video is based on "The Accidental Billionaires" by Ben Mezrich, directed by David Fincher. It will run from September 7 to 12, 2015 at the TV corner, The Learning Commons, 6th floor, Henry Sy Sr. Hall. On a fall night in 2003, Harvard undergrad and computer programming genius Mark Zuckerberg sits down at his computer and heatedly begins working on a new idea. In a fury of blogging and programming, what begins in his dorm room soon becomes a global social network and a revolution in communication. A mere six years and 500 million friends later, Zuckerberg is the youngest billionaire in history, but for this entrepreneur, success leads to both personal and legal complications (from source video). On 25 August 2015, the 17th Knowledge for Development Community (KDC) in the country officially opens at The Learning Commons, made possible by the World Bank Philippines, in partnership with the Jesse M. Robredo Institute of Governance (JRIG). KDCs are schools, policy and research institutions that work in partnership with the Bank promoting knowledge sharing about development issues. These are also online resource centers open to the public where Open Development sites of the Bank are also made accessible to all for free (read more about KDC Philippines here). During its launch, DLSU President Br. Raymundo B. Suplido FSC gave his words of welcome and anticipation on this meaningful partnership. Mr. Motoo Konishi, Country Director of the World Bank Office in Manila, shed light on the thrusts of the KDC and some insights on the country's progress and development. Dr. Francisco A. Magno, Director of the JRIG, looks forward to this partnership and to holding more knowledge sharing activities at the KDC. The Memorandum of Agreement (MOA) formally sealed the partnership. Signing for DLSU were Br. Ray, Dr. Magno and Associate Vice Chancellor for Academic Services Ms. Kai Shan L. Fernandez. Mr. Konishi signed for the Bank. Hon. Maria Leonor "Leni" G. Robredo, Representative of the 3rd District of Camarines Sur, and better half of the late Mr. Jesse M. Robredo, also witnessed the inking of this Agreement. A knowledge forum on "Sustaining Governance Reforms for Inclusive Growth" immediately followed. Dr. Magno, Mr. Rogier van den Brink, Lead Economist and Program Leader, World Bank, and Hon. Robredo served as discussants. A ribbon cutting ceremony to formally open the KDC space at the 13th floor was held right after the forum. Meanwhile, the Robredo Week exhibit at The Learning Commons also opened at the 6th floor, which was graced by Ms. Patricia G. Robredo, Governing Board Member of the Jesse Robredo Foundation, daughter of Mr. and Hon. Robredo.